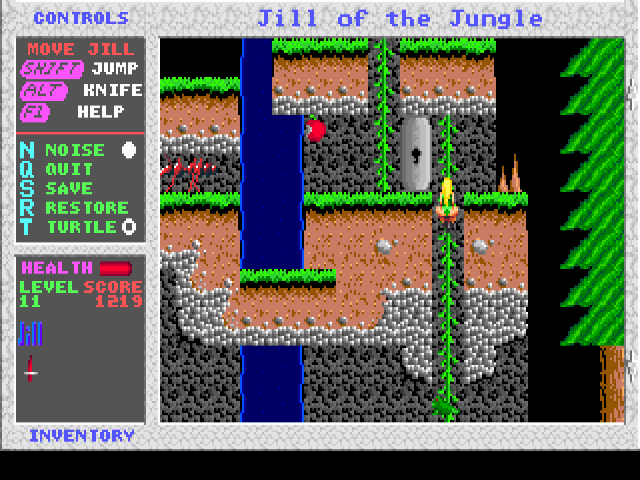 You can play Jill of the Jungle on this website so you don't need to download and install the game on your computer. We recommend to use Google Chrome when playing DOS games online. You can download the full version of Jill of the Jungle from the website listed below. Lead the brave and beautiful Jill on a mystical journey through the jungle and the caves and dungeons below. This is a scrolling arcade/adventure game, similar in style to Super Mario Brothers. The Jill trilogy features 256-color graphics, more than 60 levels in all, and a great adventure-style soundtrack. Press X three times during gameplay. Your health will now be filled and a key and blue shield will be added to your inventory. You will also be invincible until the current level ends, except for water/spikes/etc.